Audrey (cow) is nominated for a Governor General’s Award! 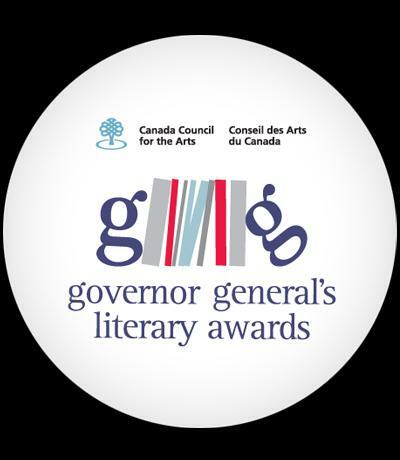 I am so thrilled to announce that Audrey (cow) has been nominated for the prestigious Governor General’s Literary Award in the Children’s Literature (Text) category. This painting was done by Helen Eaton from Arkansas, USA. I haven’t added a post to the Audrey (cow) blog for quite a while, but I feel this deserves to get on it. 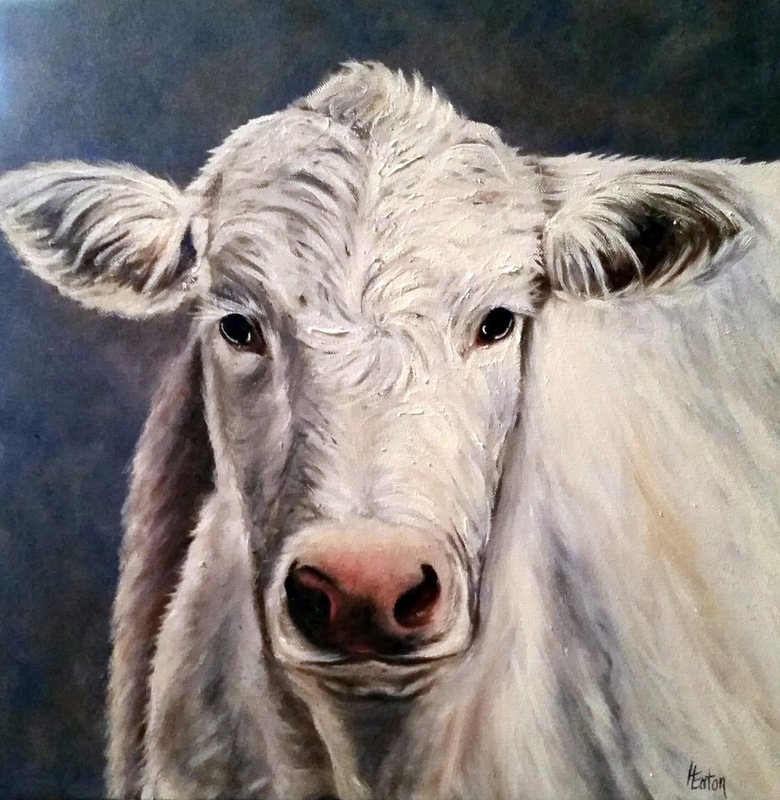 As Helen explained in her email, she likes to paint subjects that are connected to a narrative, but in this case, she painted the white cow without any reason she was aware of at the time. It was only after it was finished that she looked up stories about white cows and discovered Audrey. I certainly know of one fictional Charolais cow that would approve of this “magical” connection. Award Nominations for Audrey (cow)! Thank you to all the selection committees for bringing Audrey into such illustrious groups of books! March 31st was the deadline of the second contest on the Audrey (cow) blog. 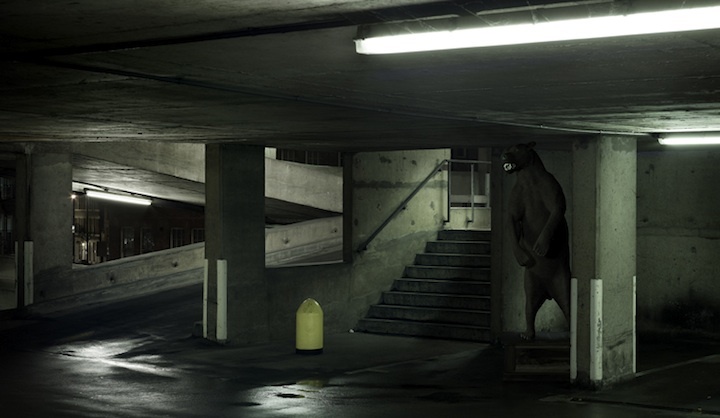 The guidelines required that you plot out an escape by an animal (five choices were given), give a reason for the escape, use one or more objects from a list supplied, bring along another animal, and finally bring your hero to a new destination. Since I had my parents in town over the holidays, they were recruited to serve as judges. The winner, as it turned out, managed to get his story in just under the deadline (which I suppose makes this a wonderful example of how procrastination works?). One day there was a goat. The goat’s name was George. George hardly got fed. He only got fed once a week because everyone forgot about him. One day he decided that he needed to escape the farm. He thought hard of how he was going to escape. He thought all night. A few minutes later Detective Duck showed up. They got a fox to distract the owner so they both could escape safely. Detective Duck and George were from Canada. Their plan was to go to the USA. The duck brought some hamburgers for George because Detective Duck knew that he was hungry. George brought the cell phone with them just in case because he thought it might be useful later on. Luckily Detective Duck knew a goose named Frank who could get them to the USA. Duck called Frank on their new cell phone. Frank is a Canadian Goose and he can carry Duck and George to the border. A few hours later they reached the border and at the border they needed to give the security guard their passports. Sadly, George forgot his passport so he needed to get a disguise to sneak past the security guard. George disguised himself as a little boy named Nolan. As quickly as he could, he went across the border. Right after they got through the border, the security guard saw George’s tail. Then the security guard started running off to catch George but luckily Frank the goose came down and started flying them to a new farm. George called the other animals from his old farm so they could come to the new farm with him. Frank went and got them all. They all remembered their passports. A person named Billy found all the animals on the street. Luckily he was a farmer and he needed animals. He brought all the animals home in his big truck. Inside the truck the fox started dancing because he heard his favourite song. His favourite song was What Does the Fox Say? Once they got to the farm Billy put them in their pens and fed them all right away. Billy gave George his favourite…hamburgers!! George was never hungry again. Congratulations Nolan! A copy of Audrey (cow) will be sent to you as well as another copy for you to donate to the library of your choice. Sadly, there is no happy ending to this story, so some of you may not wish to see the short video showing their recapture. 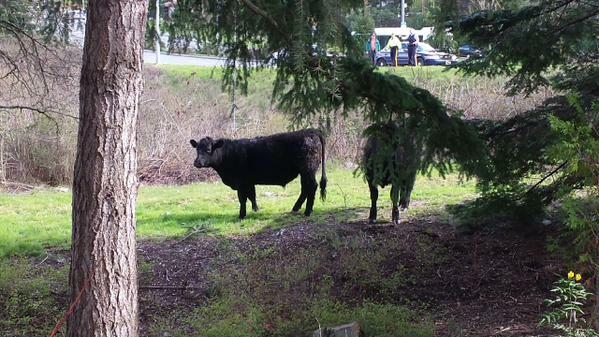 But if I were to make any comparison to the story of Audrey (cow) is that according to the article, these cows were able to get loose from the truck because the pin on the latch had mysteriously been removed. And that’s kind of interesting. Continuing with the series of looking at animals in art, I’d like to draw your attention to the work of Chris Maynard. 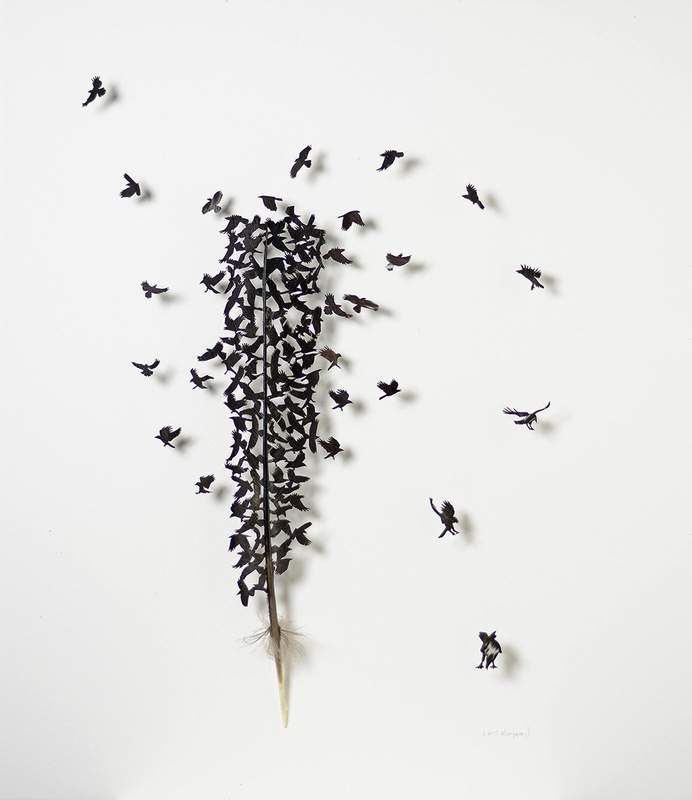 Using mainly a small scalpel, he creates intricate sculptural pieces out of feathers that reflect the full life of the birds that grew each of them. I’m posting just two photos, but do click on the links below to see all the other amazing pieces. 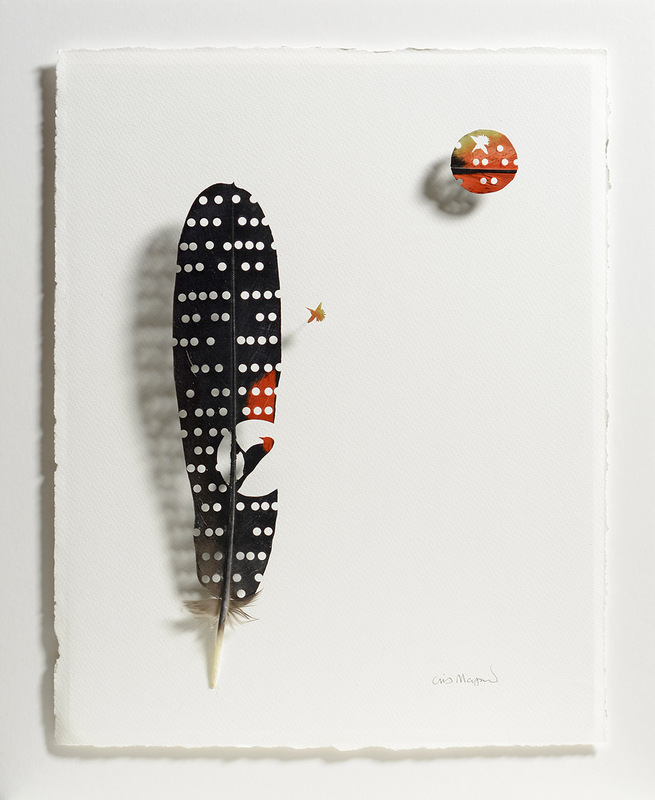 Check out Chris Maynard’s website to see more photos of his work or Feathers, Form and Function to read a short article about it. The last two videos showed deliberate effort by animals to remove themselves from captivity. In this video, it seems as if circumstance led the mandrill to a point where the possibility of escape was suddenly just there. So she/he took it. What’s more interesting is watching all the other surprised mandrills who have witnessed this unexpected act of defiance. I’d like to introduce a new series to the Audrey (cow) blog: Animals in Art. Stories are not the only way artists integrate animals and the animal world into our lives. 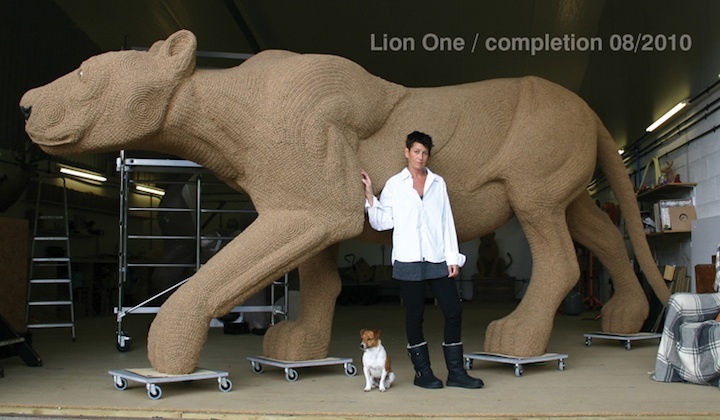 Shauna Richardson is an artist in the United Kingdom who calls herself a “crochetdermist”. Her crochet sculptures are both playful and darkly disturbing. If you have any artist’s work on the theme of animals, please contact me through the CONTACT page.